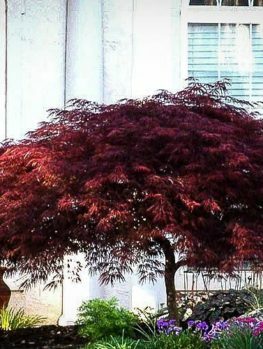 For an astonishing display of deep purple leaves, nothing beats the Purple Ghost Japanese Maple. 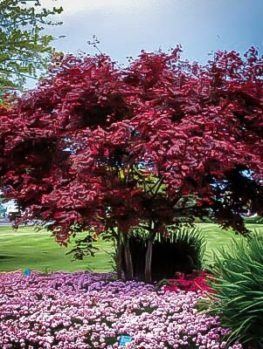 This spectacular small tree is more upright and narrower in form than most othesr, so it is ideal for a smaller space, where its stunning beauty will really stand out. 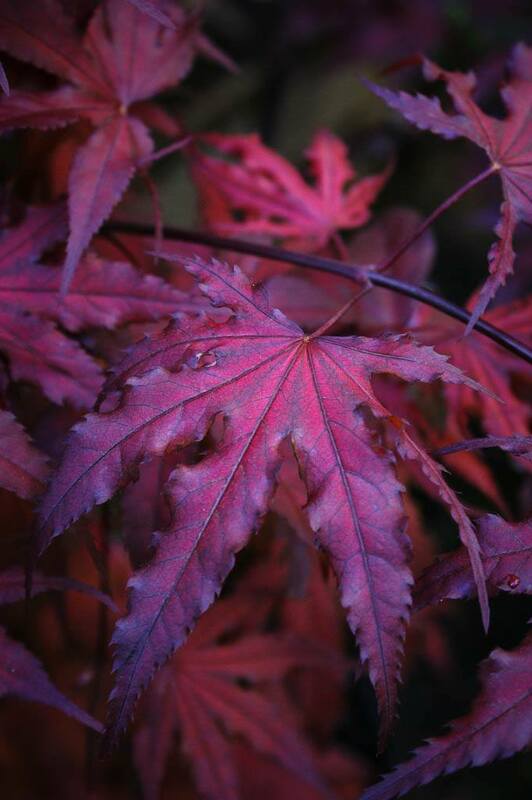 The leaf-veins are black, making the skeleton of the purple ghost, and in fall the leaves will turn shades of deep crimson, ending the year with stunning beauty. 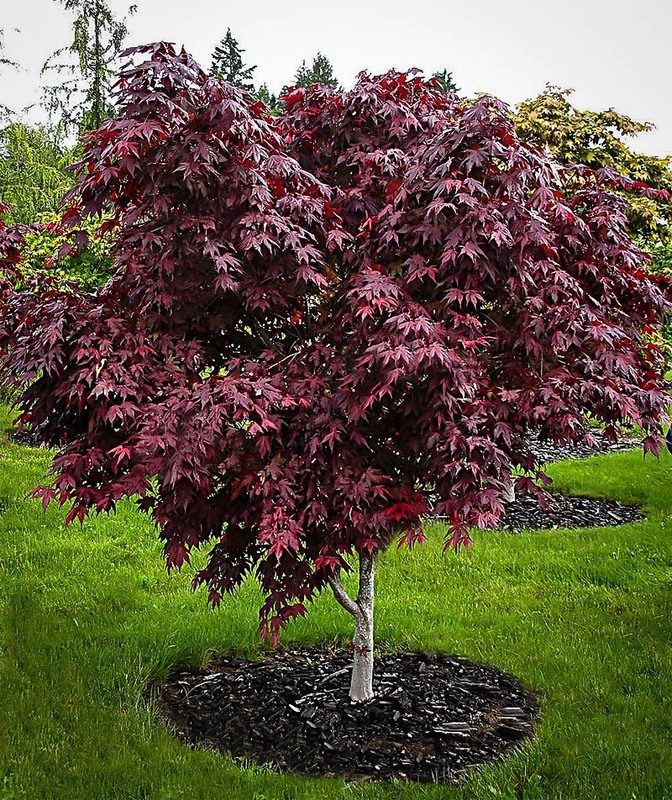 One of the most desirable trees you’ll see, the Purple Ghost Japanese Maple is a knockout beauty that will thrive in both sun and partial shade, becoming a beautiful small tree ideal for smaller gardens, wooded areas and courtyards. 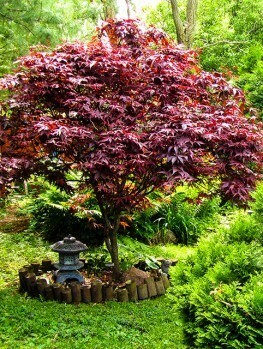 It makes the perfect container tree for a deck or patio too, or an ideal bonsai tree. If you want to add interest to a garden, and especially if you’d like it to break free of two dimensions and make full use of the space you have available, trees are an essential element to include. 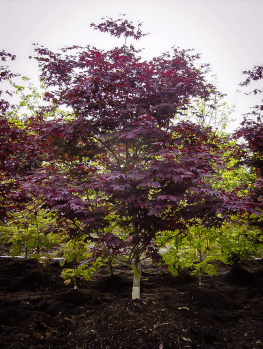 There’s a huge variety to choose from but one of the most consistently popular options is the Japanese Maple (Acer palmatum). With a range of cultivars in different sizes, shapes and even foliage colors you can find a variety to suit any location or garden style. Some of the most impressive varieties are the red-leaved ones, and Purple Ghost is particularly attractive. 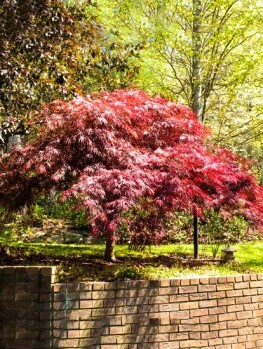 Japanese Maple is, as the name suggests, native to Japan, China, Korea and neighboring regions. 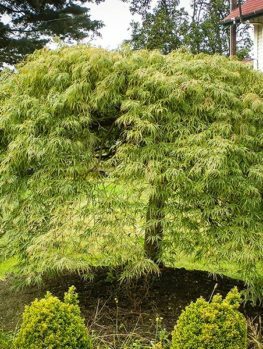 However since trade with the Far East opened up in the 19th century the trees have also become a firm favorite in the West, and they now grace many public and private gardens. Purple Ghost is a very popular variety and, thanks to its appearance, it certainly deserves to be. 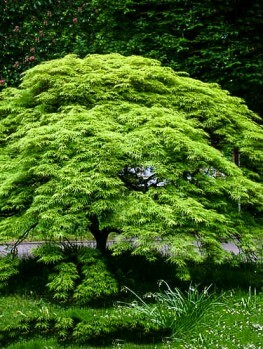 This is a fairly small Maple Tree, which usually grows to between eight and ten feet high in ten years, and has a spreading shape; expect it to reach five to six feet wide. The most spectacular feature of the Purple Ghost has to be its vivid foliage. 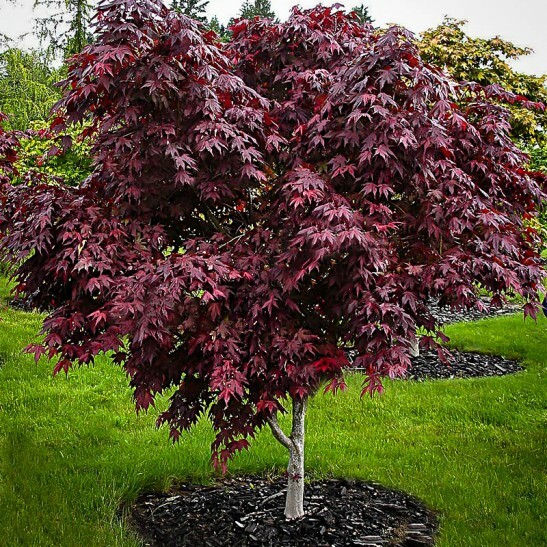 When the leaves appear in spring they’re a rich, deep purple color with unusual black veins. In shape they’re classic Maple, with five or more slender, deeply cut fingers spreading from a central stalk. As spring moves into summer the color softens, picking up more of a red hue, and in fall the tree puts on a bright yellow, orange and crimson display until the first frost strips the leaves away. The leaves have a glossy, leathery appearance on the top surface and an attractive green iridescence underneath, making for an alluring effect when wind stirs the tree. Purple Ghost doesn’t produce conspicuous flowers – they’re red and not very visible – and the winged seed pods it shows in summer and fall are overshadowed by the leaves. It’s the foliage that people plant this tree for, and that’s so impressive it justifies the decision all by itself. Purple Ghost is a relatively robust Maple for its size. It can do well in USDA hardiness zones 6 to 9, meaning it’s suitable for both coasts and a wide swathe of the Midwest. It’s not an ideal choice of winter temperatures regularly go below -10°F and it won’t thrive in dry soil, so if you’re in New England or the northern Midwest you should consider something else, but most temperate zones make an ideal habitat for it. When choosing a location for your Purple Ghost look for somewhere with fairly light soil; it doesn’t like heavy clay. Sandy soil or loam is ideal as long as it’s moist and well drained. The foliage is vulnerable to intense sun, so in southern states try to find somewhere with either dappled shade or morning sun and shade in the afternoon. That will allow its foliage to show itself off to full effect without the risk of scorching. The tree is quite resistant to wind, and while it’s best to protect it from the worst of the winter’s icy blasts this isn’t a major factor. If you’re having trouble finding an ideal spot, either because of soil type or sun, there’s some good news: Purple Ghost will do very well in a large container, where it will usually reach a height of around five feet. Once a Purple Ghost is planted it’s a fairly easy tree to maintain. It doesn’t need much fertilizer, and in fact overfeeding it can have a negative effect on its coloration. Organically rich soil is the perfect habitat and in those conditions it can usually do without any fertilizer at all; if you’re worried that the soil isn’t quite rich enough some balanced slow-release fertilizer every two years should be adequate. In summer a layer of organic mulch will help protect the roots from drying out, and if you don’t get a lot of rainfall in this season it’s almost essential. As for pruning this isn’t usually necessary, unless you need to reduce the tree’s spread. If you do have to prune do it in spring after the risk of frost is gone. There are many benefits to choosing a Purple Ghost. Its strong, unusual coloring makes it highly visible in any setting, so the eye is naturally drawn to it. 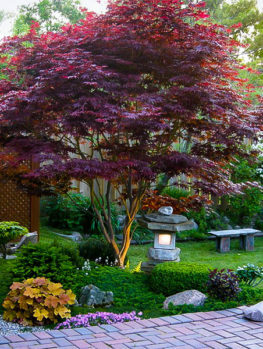 That makes it perfect if there’s an aspect of your garden you want to attract attention to – viewers will first appreciate the spectacular Maple, then its surroundings. Its spreading canopy can also provide shade to more delicate shrubs and border plants, and of course it will do its bit to attract beneficial insects. In fall the seed pods make a valuable food source for birds and small animals too. Despite its modest size Purple Ghost is a truly impressive tree, and one we have no hesitation in recommending to the gardener who’s looking for something a bit special.